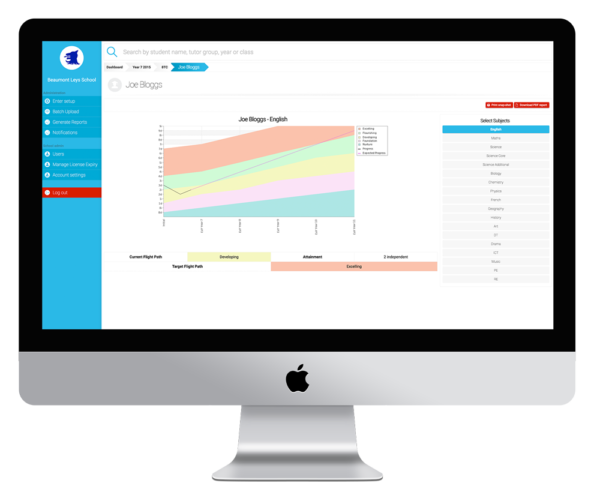 This bespoke web application gives schools an easy to use, graphical service to monitor student’s progress throughout the year. The system can be adapted to individual school requirements by first undergoing a setup process, allowing the administrator to customize a number of settings including year groups, subjects and students. Teachers and administrators can input data for individual students via the easy to use online web portal as well as bulk imports via excel spreadsheet uploads. The system can generate ‘on the spot’ reports for individual students and batch downloads, perfect for end of term reports. It was vital that we made the app as easy for the user to navigate as possible as the intention was for teachers and administrators, who may not have formal IT qualifications, to be able to easily add information as and when they need to. Rigorous quality assurance testing ensured that the tool was suitable for anyone to use, regardless of skill set. It also helps staff monitor students with alerts when students fall behind target as well as several other setting-dependent alerts. The system is currently in place in Beaumont Leys School and has drastically reduced administration time when producing end of term reports. If you are interested in this software for use in your own school we would be more than happy to discuss the success of this project with you and find a solution to suit your needs. Contact us today.